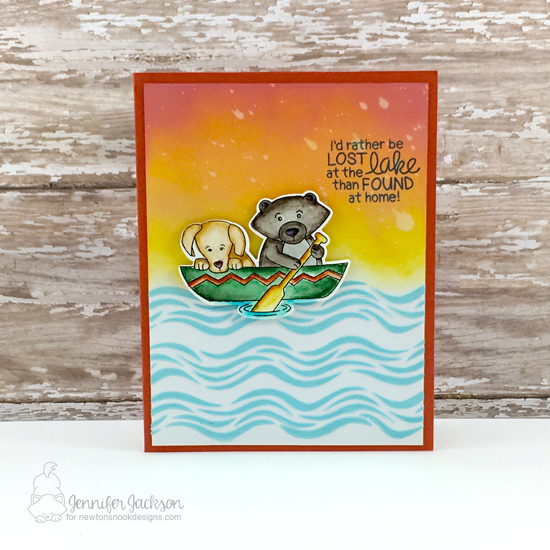 Today I'm sharing a card I created using our NEW Winston's Lake House Stamp Set and Waves Stencil. These two new products go so perfectly together! For this card I started out with the Waves Stencil and some white embossing paste. I added some color to the paste by squishing a little ink from a distress ink pad onto my craft sheet and then spreading a bit of the paste over it and mixing it up with a palette knife! Then I spread the blue paste over the stencil on a white card panel, leaving the top third white, and let it dry. 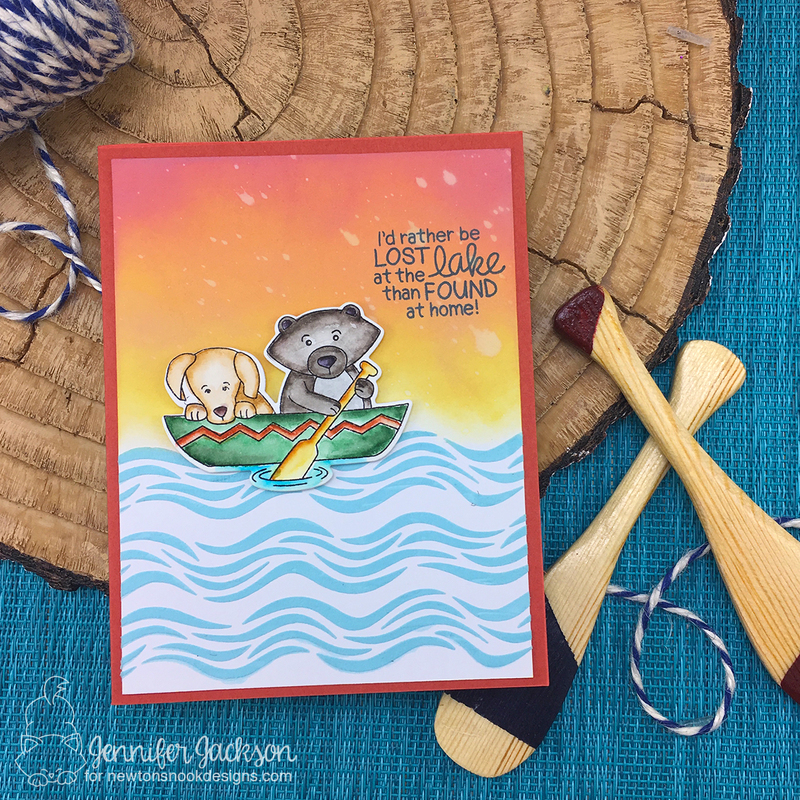 I used the image of Winston paddling in a canoe with his doggie friend from the NEW Winston's Lake House Stamp Set. I stamped this image onto watercolor paper with Archival Black ink and colored it using Zig Clean Color Brush Markers. Then I used the coordinating Winston's Lake House Die Set to cut it out. I didn't line it up perfectly (you can tell it's a little too crooked since there isn't white around the dogs head) but since I had spent all the time coloring it I decided it was OK and used it anyway! 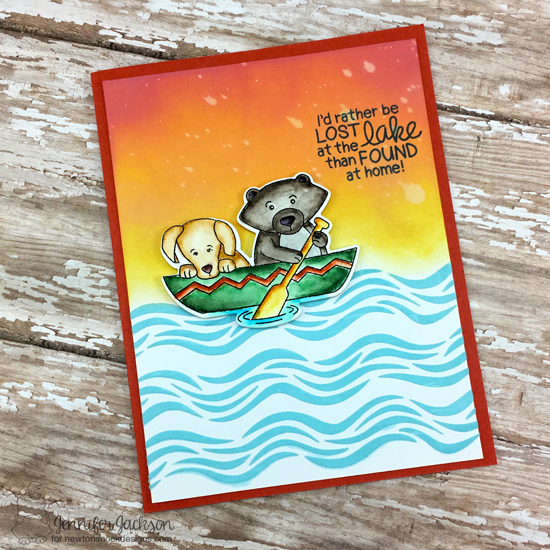 I thought about adding the image to the card with just white on the top but I decided it needed more color so I used a couple of Distress Oxide inks to make a orange to yellow sky. I like how it looks like they are boating at sunset! 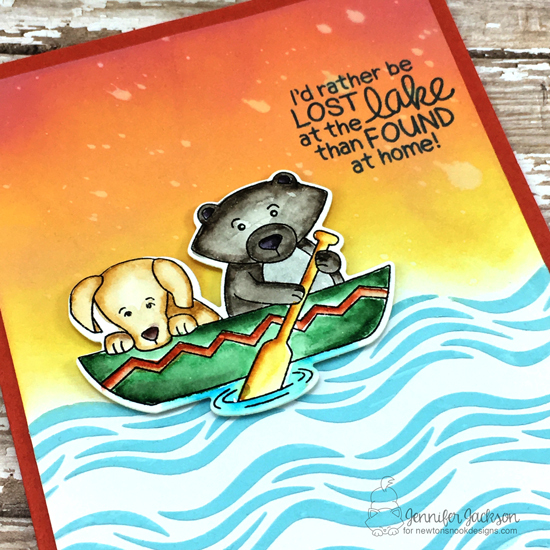 Then I added a spritz of water to give a little texture and then stamped the "I'd Rather be lost at the lake than found at home" sentiment, also from the Winston's Lake House Stamp Set. I hope you enjoyed this card today! You can find these fun new products now available in our shop! Beautiful! The embossing paste for the waves is perfect and that sky is gorgeous. Such a fun card! I love the sky and embossed waves. I'm excited about this card!! Just got my set in the mail today and now I have a card idea to make. Thanks so much!! Love this fabulous card! It makes me want to spend a few relaxing days at the lake enjoying amazing sunsets like the one you created on the background! Really love those colors!! !